The larger of a lemur's tongues is instantly recognizable as a primate tongue, and it serves the same basic purpose as tongues in other primates: helping a lemur eat. Lemurs typically eat fruit, flowers and insects. They use their tongue to help reach inside flowers to lick the tasty nectar as well as for normal eating assistance. Under a lemur's main tongue sits a smaller tongue made of stiffer cartilage. This is the grooming tongue, used as they clean other lemurs. 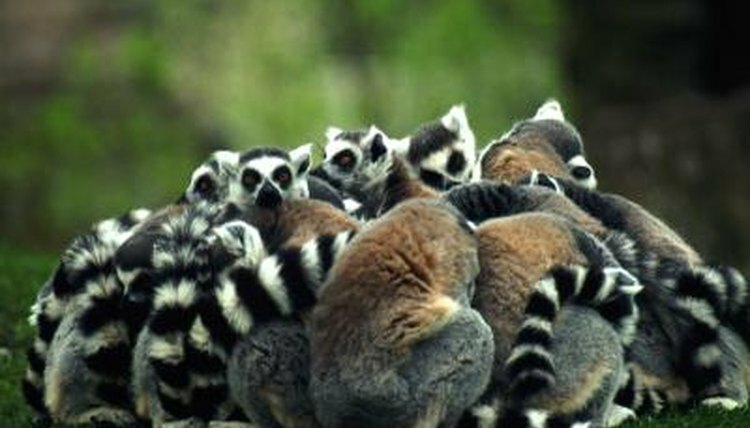 Lemurs groom each other by picking through the fur to remove dead skin and small insects. The stiff tongue reaches through the lemur's hair to the skin and helps push out unwanted items. The lemurs can move the insects into their mouths as they groom their friends for a tasty snack. The secondary tongue is handy when they get hair between their teeth while grooming. Lemurs' front teeth on their bottom jaw jut out at a slight angle to create a dental comb. A lemur slides his dental comb through the hair of other lemurs during grooming. This also removes loose hairs. While insects collected during grooming might be desirable, another lemur's hair isn't. Lemurs use their stiff second tongue to help remove those hairs. Lemurs have another grooming tool in their arsenal: claws. Most lemur toes end in nails, but the second toe on each foot has a grooming claw instead. Lemurs don't use their fingers during grooming, but they use their upturned claws to scratch themselves and their friends. An exception to this is the aye-aye lemur, which has more claws than nails.